Don is the Firm’s Senior Partner. 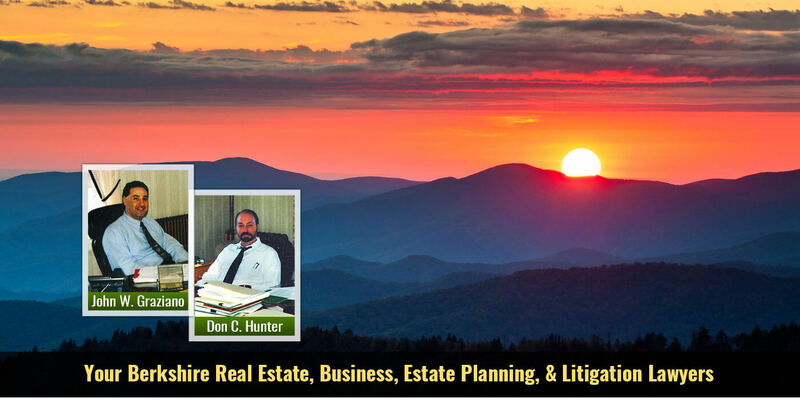 He concentrates his practice in the areas of Real Estate, Permitting and Zoning, Business Law and Banking. Don was born in Pittsfield, Massachusetts. He graduated in 1975 from the University of Massachusetts with a B.A. in Sociology. He served in Vietnam from 1970 -1971 as a warrant officer In the U.S. Army. In 1978, he graduated from Vermont Law School. Soon thereafter, he opened his practice in Lee where he has practiced ever since. 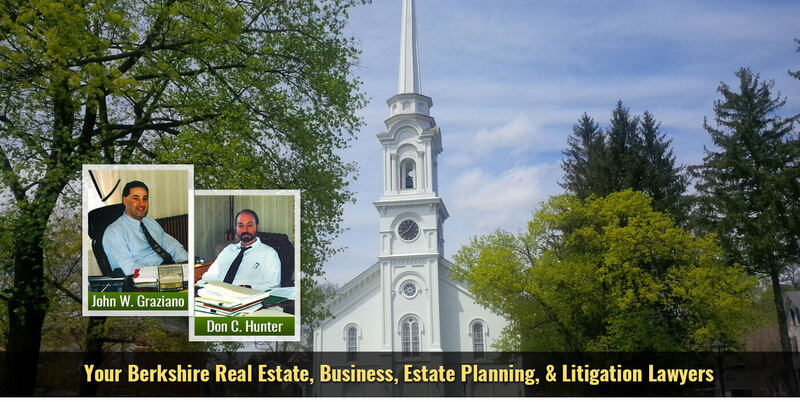 He has worked on some of the largest commercial real estate developments in and around Lee and Berkshire County including the Prime Outlets at Lee and Oak n Spruce time share in South Lee. He has also worked on numerous residential subdivisions. Don’s roots in southern Berkshire and specifically in Lee run deep. He is actively involved in the community, most recently serving as a Vice President of the Lee Community Development Corporation, President of the Lee Elderly Housing Corporation and as a member of the Lee Central School Re-use Committee. Don is admitted to practice in the Massachusetts. You can e-mail Don at don@berkshirelawyers.com. 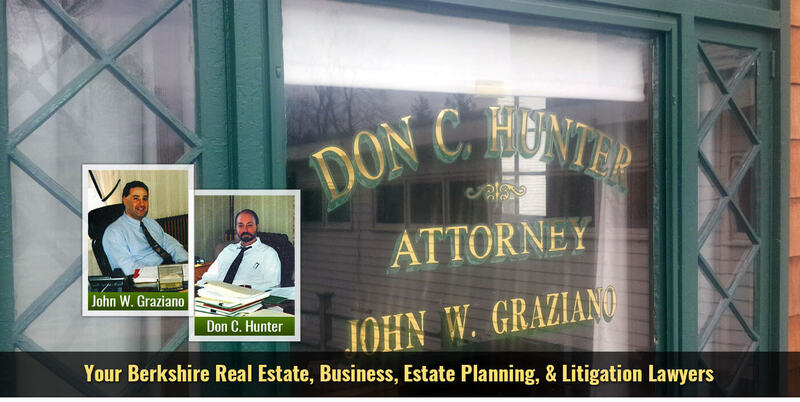 John is a partner in the firm, joining Don C. Hunter in 1993. 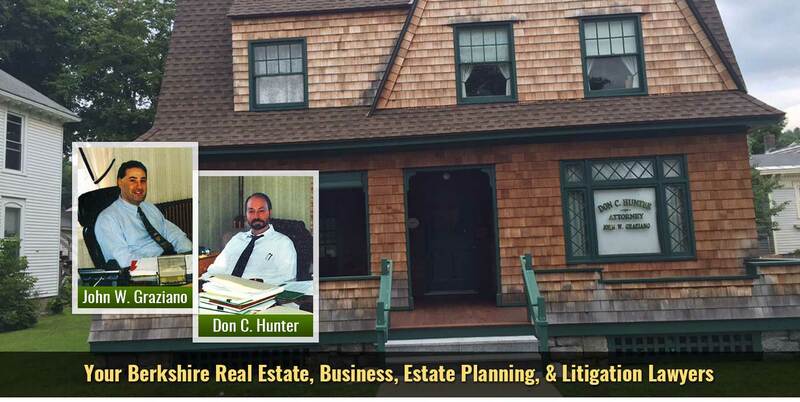 He concentrates his practice in the areas of Real Estate, Business Law, Estate Planning and Litigation. Over the past few years he has been involved as lead and co-counsel in several very large, complex litigation cases and worked with numerous hi-tech companies on many diverse business issues. John has also worked on corporate, financing and title issues for several very large apartment complex projects throughout MA. 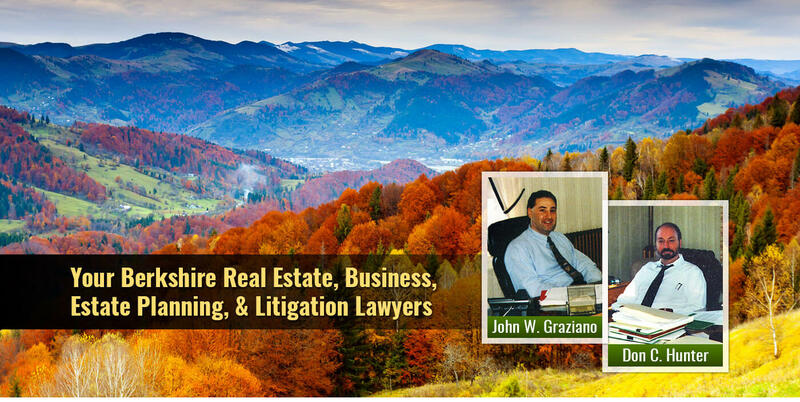 In addition to these activities, John is also actively involved in the firm’s residential and commercial real estate practice throughout Berkshire County. He was born, on Long Island New York. He graduated from Allegheny College with a B.A. in English and a Minor in Economics. In 1991, he graduated from Albany Law School where he was a member of the Law Review. John believes in giving back to the community where he and his wife and children reside, serving as a member of the Chesterwood Museum Council, President of the Lee VNA (now known as Porchlight VNA) Chairman of the Town of Lee Finance Committee, and as a member of the St. Mary’s RC Church Finance Committee. He has coached youth soccer, baseball and basketball teams and had served on the Board of Directors for Lee Youth Soccer and Lee Cal Ripken baseball. John is admitted to practice in the Massachusetts and Federal Courts. John can be reached at john@berkshirelawyers.com. Elizabeth Burdick has been with the firm for many years handling residential real estate matters. Betty handles both purchases and sales of residential real estate and assists the firm’s lawyers in Estate Planning matters. She can be reached at betty@berkshirelawyers.com. Lynette Dukehart is a more recent addition to the H&G legal team but still has over 10 years’ experience. She handles all of the firms extensive residential real estate refinancing and bank related activities. She also assists in collection and litigation support roles as well. Lynette can be reached at lynette@berkshirelawyers.com.